Date: Wednesday, 28th October 1987. Competition: League Cup, Third Round. 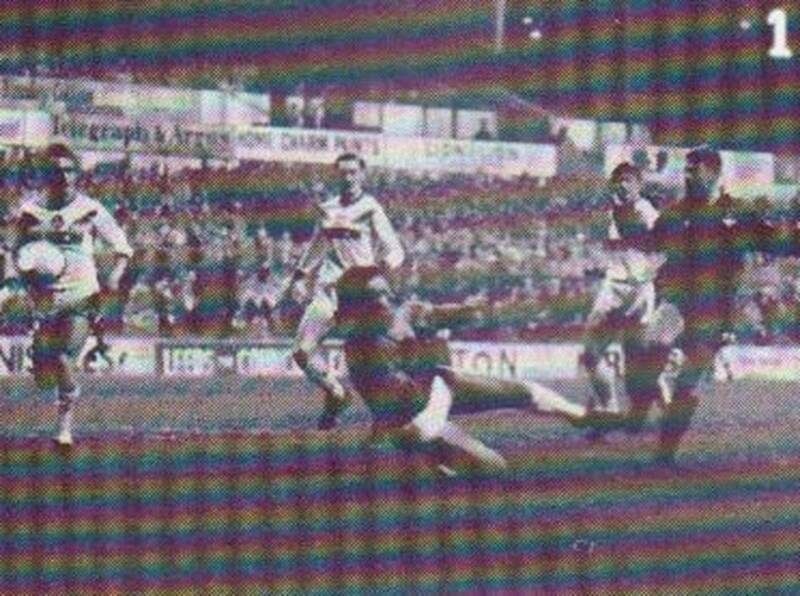 Score: Leeds United 2 Oldham Athletic 2. Scorers: Leeds United: Swan (2). Oldham Athletic: Wright, Williams (pen). 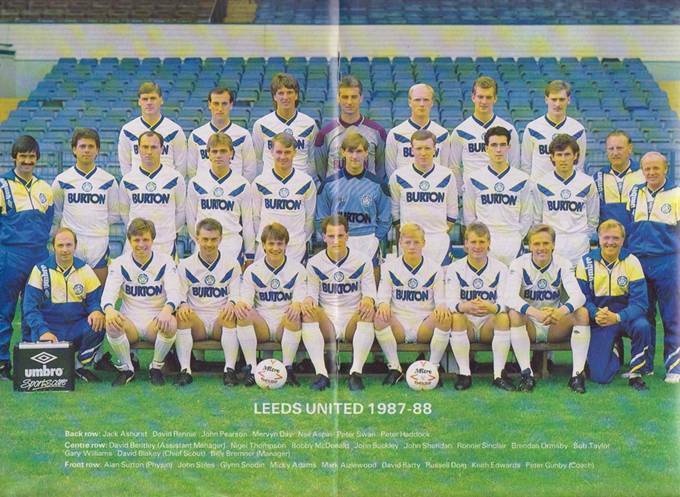 Leeds United: Day; Aspin (Stiles), Adams; G. Williams, Ashurst, Haddock; De Mange, Sheridan, Taylor, Swan, G. Snodin. 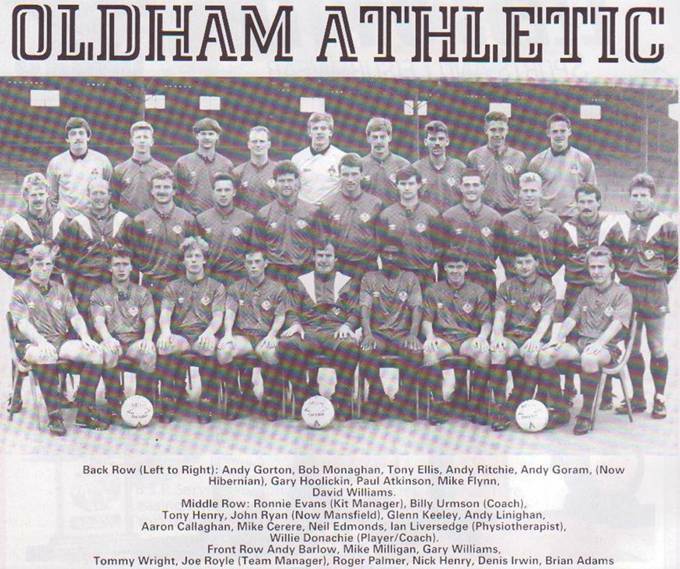 Oldham Athletic: Gorton; Irwin, Donachie; Callaghan, Linighan, Milligan; Palmer, T. Henry, Cecere (Wright), N. Henry (Keeley), G.A. Williams. 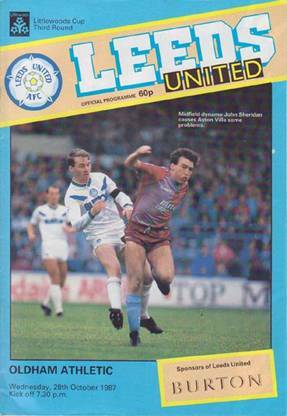 Leeds United have had some close encounters with Oldham Athletic over the years, particularly in the 1980’s, but the Latics had to rely on a last gasp penalty to rescue their Littlewoods Cup game at Elland Road in October 1986. The penalty, the third to be awarded against United in as many games, left players and fans fuming with arguments raging long after referee Colin Trussell left the pitch. It required an after-match inquest to determine just what had prompted the Liverpool-based official to reach the decision which cost United the game. 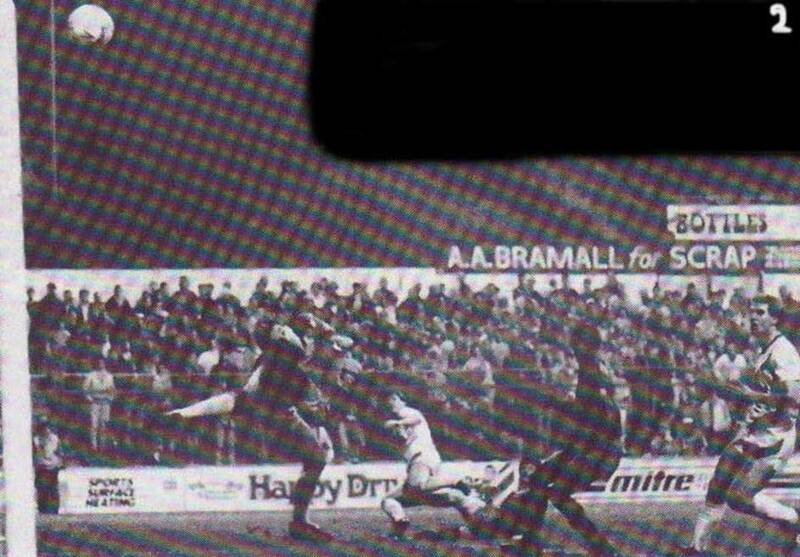 Oldham boss Joe Royle said it was a ‘blatant’ penalty for shirt-pulling by John Stiles on Mike Milligan. Stiles explained that he merely challenged for the ball and added that former United striker Tommy Wright had sympathised with him later by saying he did not think it was a penalty, but the referee’s decision was the one that counted and he had no hesitation at all in making the award. 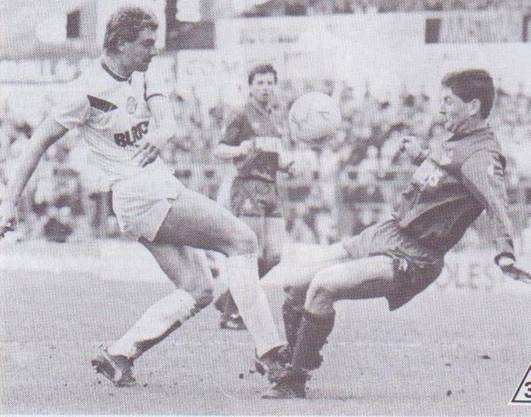 United fielded a new attacking spearhead of Bob Taylor and Peter Swan and it worked quite well, Swan heading United into the lead on the half-hour, but Oldham drew level again, Tommy Wright showing a clean pair of heels to the United defence after a through pass from Tony Henry. Another goal from Swan, who diverted John Sheridan’s in-swinging corner past Andy Gorton for his fourth goal in three matches, restored United’s advantage twenty minutes from the end. 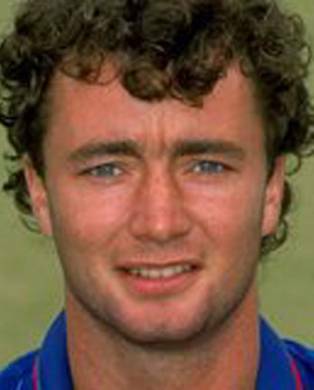 Oldham’s Garry Williams made no mistake with the spot-kick. Micky Adams had never stopped working in United’s cause, and neither had Ken De Mange while Peter Swan had been a frequent source of concern to the Latics defence, but there was a painful experience for Neil Aspin, who was carried off on a stretcher after dislocating his left shoulder. At the end of the game, however, the Oldham manager could scarcely disguise his delight as he looked forward to welcoming United back to what he described as ‘plastic paradise’ of Boundary Park. There was a broad smile on his face when he took into account United’s intense dislike of Oldham’s artificial grass, on which the replay would take place. 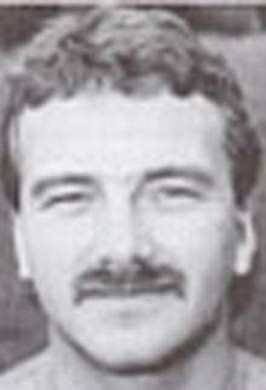 He knew the Cup pendulum had swung in Oldham’s direction, and so it proved as his men went on to beat United 4-2 after extra-time in the replay, despite goals from Glynn Snodin and Bob Taylor. Summary from Today: A hotly disputed last minute penalty gave Oldham a Littlewood’s Cup lifeline in an explosive Third Round tie at Elland Road. 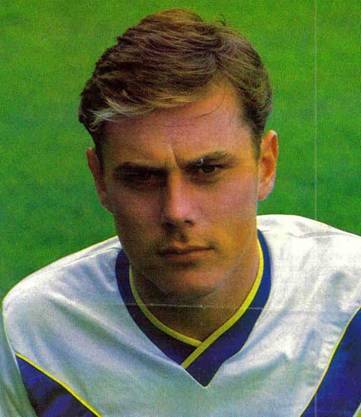 Gary Williams grabbed the equaliser after Leeds players had surrounded the referee to protest against the decision, which remained a mystery. Until then Leeds had looked certain of victory, although it took a bizarre goal in the thirty-first minute to set them on their way. Jack Ashurst’s free-kick fell comfortably to a cluster of Oldham defenders, but Aaron Callaghan back-headed into the path of Peter Swan, who headed powerfully into the top corner for his third goal in three games. 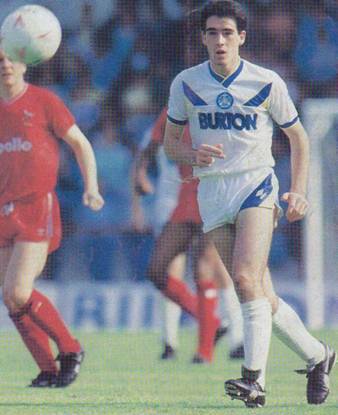 But Leeds were sent reeling after the break with a double disaster. Neil Aspin was stretchered off with a shoulder injury and Oldham substitute Tommy Wright, pushed on while the full-back was receiving attention, promptly equalised against his former club. It took another remarkable goal for Leeds to restore their advantage in the seventieth minute. 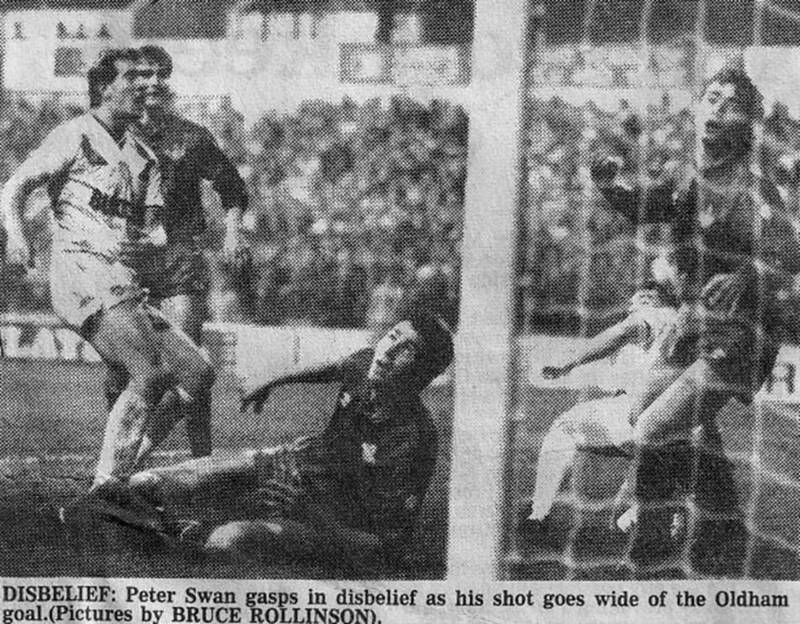 John Sheridan’s low in-swinging corner was dummied by Ken De Mange at the near post and squirmed into the net through a ruck of defenders under pressure from Peter Swan. It was a dream return for Tommy Wright, sold to Oldham at the start of the previous season. The tiny striker, who had been struggling for form and fitness, came on as one of three consecutive substitutes in the fifty second minute, two tactical and one enforced, and after just eight minutes of action he had pulled his team back to 1-1. 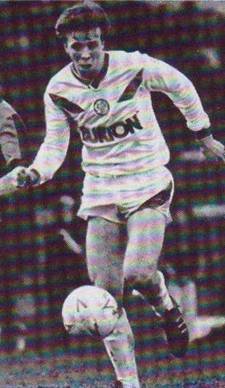 Wight and Glenn Keeley had been thrown into the fray to add some bite to the Oldham attack, while Leeds had been forced to reorganise their defence when right-back Neil Aspin was stretchered off the pitch with a dislocated shoulder. Suddenly, Leeds were caught napping by a Tony Henry through ball. 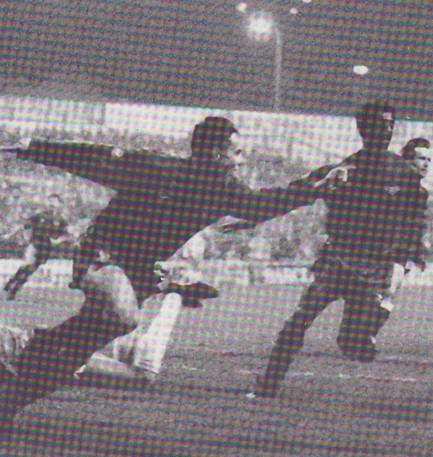 Wright latched onto it, accelerated clear of his markers and slipped the ball brilliantly past goalkeeper Mervyn Day. 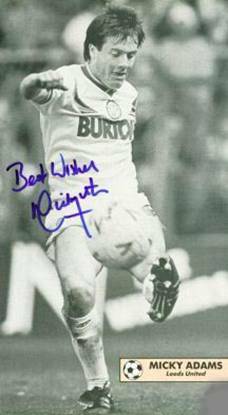 Leeds had taken the lead in the thirtieth minute when Jack Ashurst floated a free-kick into the penalty area. Oldham centre-half Aaron Callaghan inadvertently helped the ball on and Peter Swan headed the ball into the top corner. Familiarity seemed to have bred stalemate before and after the goal, as it was the eighth time the teams had met in the previous thirteen months. But these substitutions in the fifty-second minute made all the difference and added new life to the tie. Tommy Wright’s goal briefly galvanised Oldham, but Swan restored the Leeds advantage with a bizarre goal in the seventieth minute. 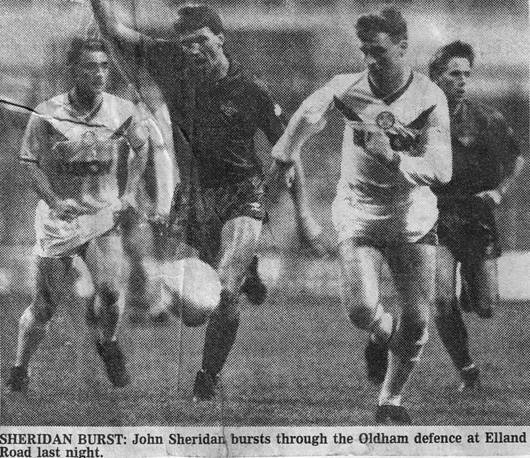 John Sheridan fired in a low, in-swinging corner, Ken De Mange let it run through his legs on the near post and Peter Swan got the vital touch to deflect the ball over the line with Oldham defenders standing helpless. That seemed to have knocked the stuffing out of the Oldham attack, and Leeds were cruising into the Fourth Round draw until the dramatic last minute saver. The late tension was extended through eight minutes of injury time but there was to be no extra twist to the tie. 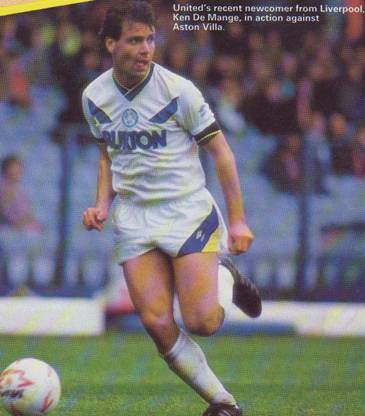 There were bookings for Bob Taylor and John Sheridan for Leeds and Roger Palmer and Mike Milligan for Oldham, but the game, although heated at times only threatened to turn nasty after Mr Trussell’s last minute penalty decision.